The results you want.The care you deserve. Quality professional Physical Therapy services in Connecticut offering a wide variety of health services to help you get back on your feet - faster. Anew Physical Therapy located near the Southington/Cheshire line in Connecticut provides each and every patient quality injury care in the areas of Physical Therapy, Sports Medicine, Rehabilitation, and Ergonomics Assessment / Training. Our professional licensed Physical Therapists work closely with each client on an individual basis - from start to finish - to better assist them toward their goal of recovery. Through hard work and a positive attitude, we can help you reach that goal. PTs are highly-educated, licensed health care professionals who can help patients reduce pain and improve or restore mobility-in many cases without expensive/invasive surgery, and often decrease the need for long term use of prescription medications and their side effects. Each visit lasts approximately one hour. How often should I have Physical Therapy? Two to three visits per week is average, depending on your diagnosis. Who will be providing my treatment? Every one of your sessions will be with a LICENSED PHYSICAL THERAPIST only. You will not be treated by an aide in a busy gym. We never have more than 2 patients in the clinic at once, and usually your treatment is completely one on one. What should I bring or wear to my appointment? Please bring your insurance card and license/photo ID with your date of birth, and a PT prescription if you have one. You can also print out our forms ahead of time, fill them out and bring them with you. See our “Forms” page. Please wear or bring comfortable/unrestrictive clothing that allow access to your injured area. Sneakers are great too! Please provide 24-hour notice for any cancellations to avoid missed appointment fees. Is a doctor's prescription required to receive Physical Therapy? Typically only if you are using Medicare or Workers Compensation, but you should check with your insurance plan to be sure. Please contact your insurance company to obtain your benefits information. Co-Pays or Co-Insurance may apply. We will also verify your benefits upon receiving your copies of your card. Thank you for being so nice to me. I enjoyed my times with you and your therapy is excellent! My wrist is better! I wanted to say thank you for everything with my back and neck! Feeling much better! I will miss all our talks! Thank you again! Thank you for getting me through a difficult time. I was so blessed to have a good doctor and a good therapist. My progress was because of you. Much love and gratitude. Thank you for helping me with my physical therapy. You showed me the correct exercises to do at home. Combined with my office visits I am feeling much better. Your professionalism in the office was great. My right knee was in so much pain when I first came to you. Thanks to you that my knee is pain free. Now I am able to do things that I haven’t been able to do in a very long time, especially waking my dog. Thank you so much for all that you’ve done for me. Words cannot express the gratitude I have for you! Your aggressive nature along with your strong sense of compassion made it possible for me to endure and conquer what seemed to be a never ending battle for me. I thank you!! Not only did I find a great therapist, but I’d like to think I made a great friend along the way too!! I made it to the top of my mountain!!! To think that 4 months ago I couldn’t walk and now I can climb mountains. Through all the hours and weeks of therapy you encouraged me to work harder and never let me take the easy path. Your expertise and encouragement motivated me to push myself and believe that I could recover from my injury. You are amazing and I cannot begin to express how much I appreciate all you did to help me get here. Thank you! Thank you very much for your help with my back problem. The exercises have made a big improvement. The tenderness and stabbing pain are gone. I don’t dread laundry, cooking or yardwork now. I’ve recommended you to several of my friends. Thank you again. We have seen both Mike and Jessica Suomala for almost all members of our family for various injuries. They have always been very thorough in both their diagnosis and treatment. They are both very caring, compassionate and always very professional. I especially like that I can see the same PT as my children since they have extensive experience in treating both adults and children. They always make sure I leave with the proper exercises to do on my own in between treatments. We continue to go back to both of them for any of our Physical Therapy needs. 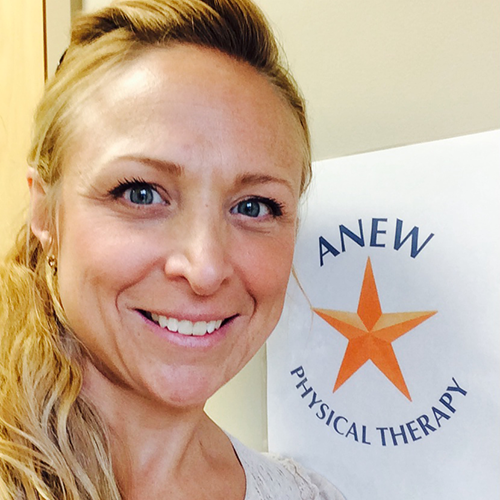 My experience at ANEW Physical Therapy was great. It was a very comfortable and relaxing atmosphere. Jessica was very knowledgeable in every aspect of my aches and pains. She answered my questions and had a solution to my problems. I enjoyed working with her and I wish her well in her ANEW venture. © 2015 Anew Physical Therapy. Website designed & developed by ABC Marketing.